There’s a certain irony around here, in case you haven’t noticed: my first cookbook, which focuses exclusively on doughnuts, was released the same month I started eating gluten- and egg-free. When the diagnosis came, I thought it meant no more doughnuts. Ever. Sure, there’s a recipe for gluten-free old-fashioneds in the book, and it’s a good one, but no eggs? I wasn’t sure I wanted to eat ingredient-free doughnuts. I thought they’d be the pastry equivalent of tofurkey. Sure, they look like the real thing, but without the flavor, what’s the point? When I told our nanny that I wanted to make doughnuts, she looked at me incredulously. “Doughnuts?” she asked. “You can think of doughnuts now?” I’m not sure why, people, but I had to try. I had to stir flaxseed meal into a little slurry–a thick one, to replicate the texture of egg yolks–and whip it around in the mixer with the sugar, and watch it behave surprisingly like the egg yolks always did, last fall when I was testing for the book. I had to fry them up, and watch them ridge up into the classic old-fashioned shape with, yes, a little surprise. I had to eat them, and feel the smooth, honey-tinged icing break across the roof of my mouth. And I had to say it: these were pretty good doughnuts. What I like about this book–and what I think you’ll like, too–is that although the recipes are based on Top Pot‘s unique methods, they’re really quite flexible. 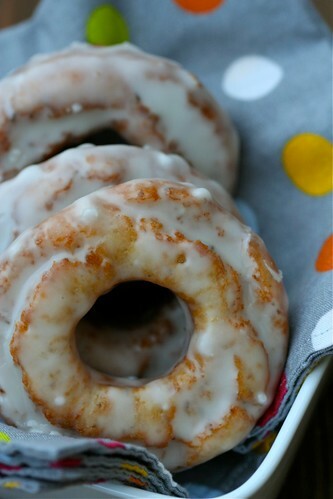 You want clove-spiced doughnuts with orange glaze? Add some ground cloves to the yeast-raised recipe and look for that orange glaze. 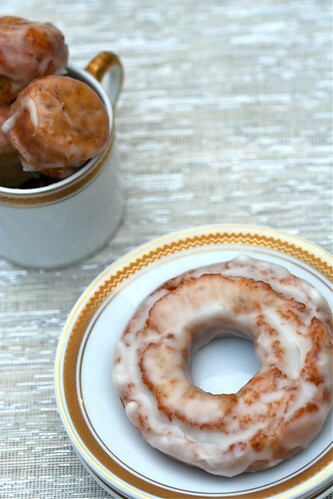 You want gluten-free pumpkin cake doughnuts? The tools are there. Even after binging in a major, major way on doughnuts while I was writing it last year, this book thrills me because it opens such a big, wide, welcoming door, and I can’t quite bring myself to stop frying, now that I’ve started up again. You knew, of course, that this month is National Doughnut Month. This month, I dare you: make some doughnuts. Join me, and other bloggers, in frying up your favorite fresh, fat orbs from childhood, and decorating them however you choose–then tell us about it. Paste your post below, or just tell me about your favorite doughnut experience, or email me (jessthomsonATmeDOTcom) and let me know when you’ll be posting, and I’ll give you a shout. Because above all, this here doughnut thing is supposed to be fun. If you’re in the Seattle area, I’ll be signing at the following locations in the months to come. There will be doughnuts, of course. See you soon. 10/12/2011, 6 – 7:30 p.m.
10/15/2011, 12 – 1:30 p.m.
10/19/2011, 6 – 9 p.m.
10/27/2011, 6 – 7:30 p.m.
11/10/2011, 7 – 8:30 p.m. This recipe is a spin on the one for gluten-free old-fashioned doughnuts found in Top Pot Hand-Forged Doughnuts: Secrets and Recipes for the Home Baker, only this doughnut is even more inclusive; it’s made without eggs. To get the doughnuts to split like regular old-fashioneds, make sure you wait until you can see cracks in the surface of the dough when you’re frying them on the first side before flipping them over. Let them cool for about 5 minutes before glazing the first time. Sift the gluten-free flour, baking powder, xanthan gum, salt, and nutmeg together into a medium bowl, and set aside. In a stand mixer fitted with the paddle attachment, mix the sugar and shortening for 1 minute on low speed, until sandy. Whisk the flaxseed meal and water together in a small bowl and let it sit for about a minute. Add it to the sugar mixture, then mix for 1 more minute on medium speed, scraping the sides of the bowl with a rubber spatula if necessary, until well blended. Add the dry ingredients to the wet ingredients in three separate additions, alternating with the sour cream, mixing until just combined on low speed each time. The dough will be sticky, like cookie dough. Using a candy thermometer to measure the temperature, heat oil (at least 2 inches deep) in a deep fryer, large pot, or high-sided frying pan to 350°F. (Really. Measure the temperature.) Roll the chilled dough out on a counter or cutting board generously floured with gluten-free flour to 1/2 inch thick, or about 8 inches in diameter, flouring the top of the dough and the rolling pin as necessary to prevent sticking. Cut into as many doughnuts and holes as possible, dipping the cutter into flour before each cut. Fold and gently reroll the dough and extra holes (working with floured hands makes the dough less sticky), and cut again. Shake any excess flour off the doughnuts before carefully adding them to the hot oil a few at a time, taking care not to crowd them. Once the doughnuts float, fry for 60 to 75 seconds per side, or until deep golden brown on both sides. Drain on paper towels/absorbent paper. Place the confectioners’ sugar, honey, salt, vanilla, and hot water in a large mixing bowl or in the work bowl of a stand mixer fitted with the paddle attachment. Using a whisk, or with the machine on low speed, blend until the mixture is smooth and all of the sugar has been incorporated, scraping the sides of the bowl with a rubber spatula if necessary. If the glaze seems too thick, add more hot water, a teaspoon at a time. To glaze, dip one side of each doughnut into the icing when the doughnut is still a bit warm, and let dry for about 10 minutes. Dip it in again, for a second coat, then let dry before serving. It would be such a thrill for me if I made it to the November book signing. I’m in Chico, CA, and I’d love to make a trip for it! … aha! an inspiration for a new book – Top Pot GF – and for Top Pot to make GF doughnuts for their GF customers! COngratulations!! I can’t wait to see the book! And she’s thin, too. Damn your genes. I just saw this on The Kitchn!!!!! That is SO exciting! LOVE it! Can these be made without the sour cream? We are dairy free too. Lindsey, I haven’t tried them without the sour cream – sorry! I’d give you full reign to try, though, and report back! Try using dairy free yogurt it generally subs really well for sour cream. I’m sorry to hear about your diagnosis, it can be difficult but you seem to have a great attitude. Now I can’t wait to see what happens when you branch off from Bob’s Red Mill into your own, tastier mixes. Guess that means I’ll have to add you to my reader. Good luck with the book and your new lifestyle. I’m all eyes. If someone isn’t egg free…what’s the ratio of eggs instead of the flax seed meal? Yum! These look amazing! Jen, it’s 2 large egg yolks, in place of the flax and water. (You won’t need the water, either.) Good luck! I’m so glad I found you! Top Pot’s are my FAVE, but being wheat sensitive (and living in Federal Way), I don’t get them anymore 😦 I’ve been doing gluten free, egg free baking for a bit now… With a few epic fails. Doughnuts are one thing I haven’t been able to find a recipe for. I will be making these soon! How long can these be stored? (and where, fridge?). OR have you ever halved the recipe?! T, do you mean the dough or the finished doughnuts? I’d make a whole batch and just roll out and fry half a batch at a time. Let the oil cool on your stove and reuse it the second time. Thanks so much!!!!! Can’t wait to try them! Wow. Just made these, and they turned out GREAT. Thanks!! Thanks for making them yeast free too! My daughter was just diagnosed with an egg allergy and we are trying to eat gluten free the first day she could not have a donut she was sad. Thank you, I can not wait to try them! Do you think these could be baked in a donut pan? Oooh–honestly, I’m not sure, Michele. I’ve baked yeast-raised doughnuts in a pan before, but never old-fashioneds. The old-fashioneds really depend on the frying technique to get the signature split, so they’d look quite different no matter what if you baked them, but I think they’d still be quite tasty. Worth a try! First off, I want to say I’m a huge fan of your work! I recently just became a donut lover and my new obsession has led me to your Top Pot Doughnut book! I love all the recipes and they are all very simple and easy to make. However, I seem to be having some trouble making the donuts. My first attempt was my favorite was the Old-Fashioned Doughnuts. My second being the Feather Boa’s, another favorite! My problem here is that with both attempts my dough has come out suuuuuper wet and sticky. I understand they are supposed to be wet/sticky but these were way over. It was almost like a batter rather than a dough. There was no way to roll them out and could not cut out any doughnut rings at all. Pretty much turned out like a thick batter. I tried troubleshooting it with extra flour and kneading it a bit to make it more malleable so that I could at least roll them out. In the end, the doughnuts came out way too dense and tough, and did not have a moist cake texture. Albeit, the flavor was there but the texture and consistency was off. I was wondering what you think I could have done wrong. I followed the recipe in the book step-by-step using the exact ingredients and measuring amounts. The only difference being was I had to use a hand mixer instead of a stand mixer, since in the book it said that I could substitute it the stand with the hand mixer without being a problem. I used a low speed and tried not to over mix. I also used a volumetric system instead of weight and sifted the flours after getting the volume. And I used medium eggs instead of a large. Is it possible that using a hand mixer caused the over mixing to make them too tough? Or the egg size caused any problems? I just can’t seem to figure out if my dough is right or wrong, but feels wrong to me since it is so wet and sticky that I’m not able to roll it out at all. Hopefully, you can give me some advice to figure out what I could have done wrong! Thanks so much and look forward to more of your work! Thank you so much for this recipe! Since my husband had to go gluten-free two years ago, the one food he has consistently missed is sour cream doughnuts. We made these together this morning and they’re delicious! My husband is a huge fan of Top-Pot and it used to be one of the only things he’d cheat on. But recently he’s become too sick to cheat – even for Top Pot. My sister just sent me this recipe. I cannot wait to surprise him. thank you! What size doughnut cutter is this recipe designed for? I am going to buy one but not sure what size to get. thanks. Do you have any tips for making these chocolate? I love chocolate sour cream donuts and am also unable to eat gluten or eggs so I’m loving this recipe already. My kids will no doubt be your new fans after dessert today! I just saw your recipe to GF old fashioned donuts that I am planning on trying. I have never fried foods before and fear of burning them. I sure hope I don’t! Anyway I live just an hour south of Seattle. If I had known sooner you were going to be in the area I would have come. So now am bummed. But looking forward to trying your recipe. Would using sunflower oil or coconut oil ok to use to deep fry?